A group of us at work have started an unofficial food club. 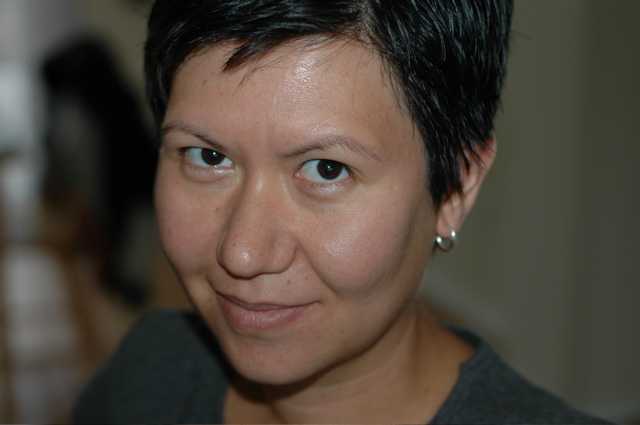 The idea is to take turns “teaching” the others about any food-related topics in which we have experience. The topics can range from stir-frying, making cheese, canning, baking, using a pressure cooker—basically anything to do with food. It’s really fun because we get hands-on “demonstrations”, but it’s still very informal and social. I volunteered to host the first meeting and the topic was stir-frying, of course! My goal was to cover technique as well as introduce some common Asian ingredients. I provided noodles, rice, tofu and all the sauces we were going to use. The attendees brought the other ingredients and their woks, if they had one. Bringing the woks worked out perfectly because we discussed the different materials and their advantages or disadvantages. I laid out a sample of all the sauces and special ingredients and allowed everyone to taste them. The only thing that scared the group a little was the fermented shrimp paste. Most of them passed on the taste test; the smell was quite enough! Thai fermented shrimp paste. Some call it stinky. I prefer "odoriferous". It will keep indefinitely in the fridge. You may want to store it in a Ziploc bag for extra protection.LOL It's also used in Thai curry pastes. It's also a good substitute for Indonesian fermented shrimp paste. The meeting turned out to be a success. Everyone enjoyed tasting the different sauces and how the flavors changed or complimented other ingredients in the final result. One person said she never tasted tofu before the meeting. She’d heard so many people say they didn’t like it, but she loved it. Yay! A convert! I love when that happens. 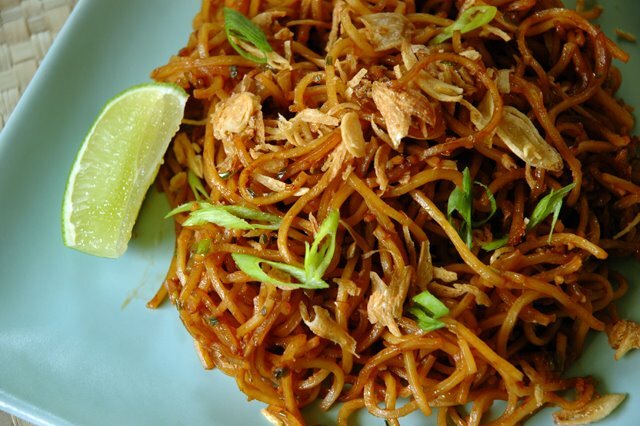 One of the dishes we prepared was Indonesian-style egg noodles. I chose this recipe because I wanted to demonstrate how to cook noodles in a wok and introduce some common ingredients in Indonesian food, namely kecap manis and fermented shrimp paste. After the taste testing though, I was afraid to use the shrimp paste. The original recipe called for 1 tbs of the stinky stuff, but I brought it down to just ¼ tsp dissolved in water to give a total of 1 tbs. Turns out I shouldn’t have toned it down. Everyone liked the dish very much but agreed it could have used more of the shrimp paste flavor. We ended up sprinkling on fish sauce to make up for the lost umami. I made the recipe again, this time using more shrimp paste, although not the entire 1 tbs, and it was really delicious. Kecap manis gave it sweetness as well a bit of saltiness. The shrimp paste shined! It came through to give a nice complexity and it was not fishy at all (although it was quite odoriferous when it hit the hot wok ☺). I recommend using it if you can get your hands on it. It’s available from any Asian market that sells SE Asian ingredients. If you can’t or don’t want to find it, fish sauce will compensate for some of the lost complexity, although it’s not quite the same. Notes: The recipe calls for 1 pound fresh, thick egg noodles. They may be labeled yakisoba-style noodles. 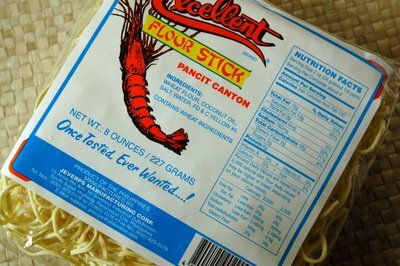 I couldn’t find any, so I used 8 oz Filipino dried egg noodles. They simply needed to be boiled for like 2 minutes, drained, rinsed in cold water and tossed with a little bit of oil to keep from sticking. 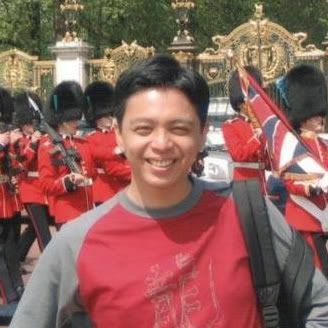 Hey manggy or Marvin, are the noodles actually called pancit canton? Or are they just trying to show these are the noodles to use for pancit canton? I'm kinda confused. The original recipe called for topping with a fried egg, but I didn’t have any left after breakfast. How disappointing because the creamy yolk goes so well with the flavors and adds another texture. Otherwise there’s not any real protein in the dish. If you wanted, you could add tofu (which is what we did for the food club version) or chicken or shrimp. Don’t forget the condiments, especially the fried onions! They add a wonderful textural component. I prefer to use an Asian brand, but Trader Joe’s fried onions are also fine. I don’t like the texture of French’s fried onions. They bread them or something. I also always serve noodles with lime wedges, sambal oelek and of course fish sauce (I can't help it, I'm Thai!) so that people can adjust the taste to their liking. If using dried noodles, prepare them first because they can be set aside. See note above about preparation. Combine the mined herbs together in a small bowl. They will go into the wok together. Dissolve the shrimp paste in water, making sure to break up the clumps. Don't fret about the smell. It will taste good! Mix the tomato paste and kecap manis together until thoroughly combined. Set aside until needed. In a wok over medium-high heat, add about 2 tbs oil (grapeseed, peanut or a vegetable oil are best). When hot, but not smoking, add the minced herbs and stir-fry until fragrant and softened, about 20-30 seconds or so. Don't let them burn! Add the shrimp paste and stir to coat the herbs. Fry for about 30 seconds. Add the noodles then the kecap manis sauce. Turn the noodles in the sauce. Make sure they are well-coated. I found that using tongs to turn the noodles works well. Just be careful not to smush the noodles. Adjust flavor with salt or fish sauce, if needed. When the noodles are heated through, they are done! Remove to a plate and keep warm while you fry the eggs (unless you are good enough to fry the eggs while stir-frying the noodles; I am not!). Serve on individual plates, each portion topped with a fried egg and garnished with fried onions and/or thinly sliced scallions. Does pancit canton mean Chinese noodles? That's what I think anyway. 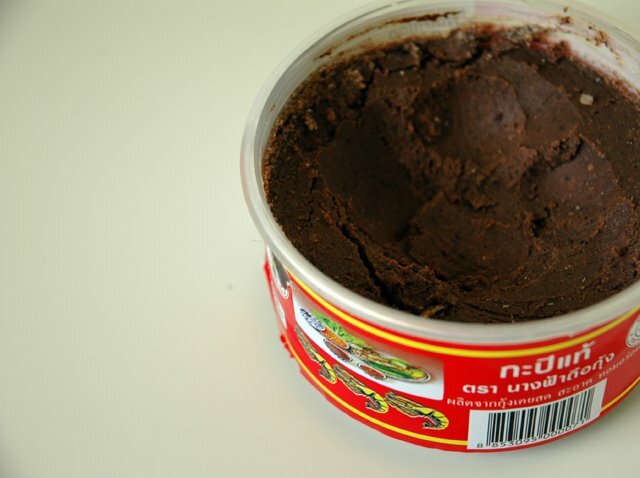 The Thai fermented shrimp paste looks very dark. VNese shrimp paste is more grayish-pink. I'll post about it soon so you can see the difference. Which totally reminds me, my mom gave me a tub of what she said was Thai sauce. Someone gave it to her and she passed it on to me. But I haven't gotten around to even opening it. Guess I should and see if you know what it is. Also, you can buy bags of fried shallots at the Asian grocery store. I'm assuming that's what you mean by fried onions? I use it to top noodles too. The fish paste is grayish pink when it's dissolved in water. Is the VNese kind solid? Yes, the fried onions and shallots seem to be one in the same. Some brands just call them shallots and some call the onions. The noodles look so delicious! I see there's a lot of variability when it comes to shrimp paste-- Filipino shrimp paste (bagoong) is not so much paste-y. More like, uh, pesto. But it should work equally as well. Thanks for the clarification. When I googled pancit canton, it seemed to always be a finished dish. Vietnamese shrimp paste isn't solid, smoother and softer from what it looks like. A free meal. Now I gotta sit up every night repeatedly clicking just to make sure I beat Manggy again. Haha. Now that I've stopped drooling over my computer screen, I can leave a comment. Please. Feed. Me. Now!!! This looks soooo goooood! Yum! I'd eat anything you made! p.s. Thanks for your kind comment on my blog. 'Pancit canton' is a finished dish. Looking at the ingredient list for the noodles, I guess they don't use egg noodles. I've always thought that they were egg noodles because they're yellowish. Guess not. Although the finished noodles does look a tiny bit different than the usual "pancit canton" noodles. These ones seem flatter and not as soft. The finished dish looks great. How did you get the noodles not to break? We always have a problem with broken noodles when doing stirfried noodle dishes. ECV, They aren't egg noodles! That completely slipped by me. I guess the yellow color threw me off too. Funny because they taste and feel like egg noodles. about the noodles breaking...I really can't say how to prevent that. I guess it's a lot of factors...well-oiled noodles, they were refrigerated, well-seasoned wok?? I noticed with the rice noodle dishes, the better oiled the noodles, the least problems I have stir-frying. Trader Joes' fried onions are pretty decent - I use them on casseroles sometimes. Maybe the noodles were yellow from lye-water, like Chinese noodles? Also, I added you to my sidebar so I'll never forget to check your page. :) I'm going to hafta add a category for Portland bloggers soon! Heather, I think I've seen the looser shrimp paste, but never used it. I suppose it's a matter of preference, like with tamarind puree. I prefer to use the blocks and dissolve them in water, but I know they come as a liquid as well. In any case, I think they are interchangeable. That paste is weird. Is it like the broth paste that when you add water, it becomes beef or chicken broth? RPO, weird is a subjective word. LOL It is very concentrated because it contains a lot less water than the looser "pastes". It's not crumbly, at least not when it's properly stored. I would imagine it would last longer than the looser pastes, but that's a pure guess on my part. Whichever type you want to use is surely fine. It's a matter of preference. Looks like a very interesting noodle dish, not like the one that I keep making over and over again (and to be honest, I`m starting to get bored!) I must try this, thanks! Hey dp - my usual shrimp paste is Malaysian belacan. It comes in exactly the same plastic container as your Thai one, but with a different label. And it is usually dark grey on the outside and pinkish grey as you dig in. BTW, I love the look of your noodles! They remind me a lot of my favorite mi goreng restaurant on Pochentong Blvd in Phnom Penh! Tom, good to know about the belacan. I wasn't sure if it was a looser variety. Try this dish! It's so easy. Did you cook this at work, or on a weekend? Yay for making a tofu convert! Double yay for getting people to like fermented shrimp paste! Nate-n-annie, we met at my house after work. We're planning on rotating houses. Next time cheesecake! It happens a lot whenever I cook with terasi (Indonesian dried shrimp paste), my husband always complains about the smell but he really loves the food afterward. We call this Bakmi Goreng or Mie Goreng. Indonesia-Eats, I think Hubby is finally getting used to the smell. It only took over 10 years! haha!